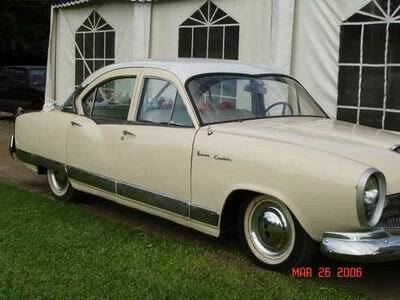 The following is a history of the Kaiser Rambler and Renault in Argentian. 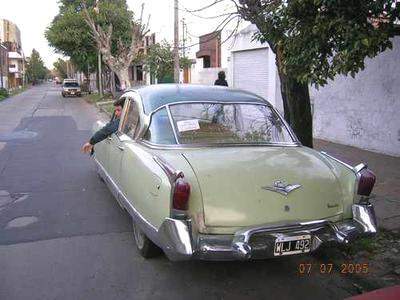 Franco Cipolla is an outstanding writer who takes us and transport us back to the 1950s to the time were Kaiser Industries were a trade sign in Cordoba, Argentina. 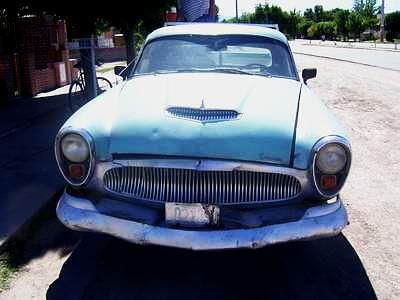 His book tells the story behind one of the most controversial and important car companies in Argentina. 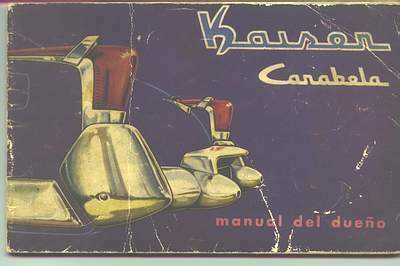 Kaiser industries were the melting pot for a new production system in the car industry in Argentina, as well as a turning point in terms of worker's organizations. 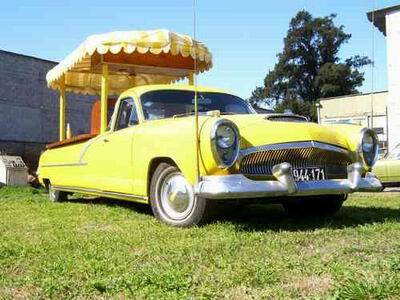 Historians, politicians, vintage car collectors. 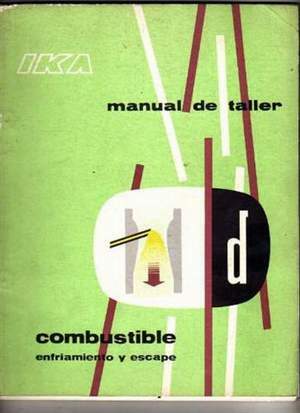 To them all, this book is a great input. 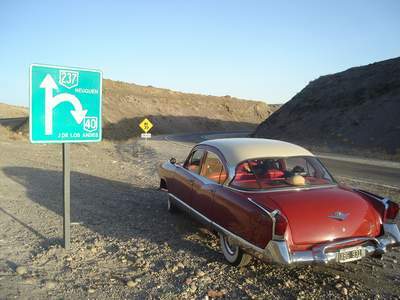 Great accuracy, fantastic pictures, a superb narration filled with anecdotes and fine information. 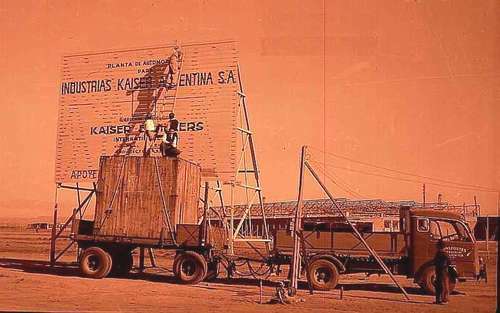 Kaiser Industries is an Argentinean based company organized with American capitals and head managers, developed by local working force. 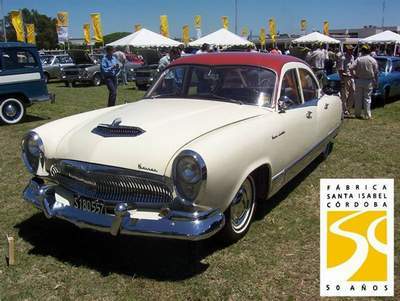 On Jan 19th 1955, Kaiser would become the first American capital automobile company production based in Argentina. 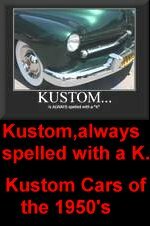 IKA was born. 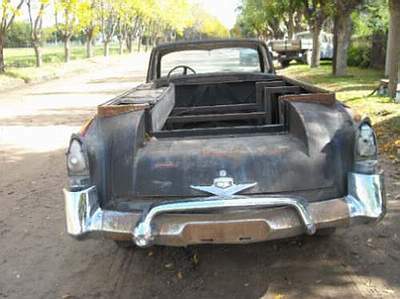 They now needed a location, and this problem was solved as soon as the Nores Martinez family donated some 30 hectares for the plant to be constructed at. The key to understanding this is that this wealthy family still owned all the area's land, so its property's value would rise immediately due to the strategic location. 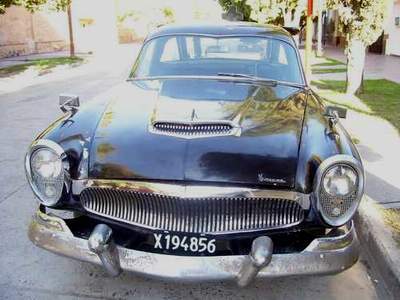 Soon IKA would develop at a fantastic rate coming to use over 225 hectares. 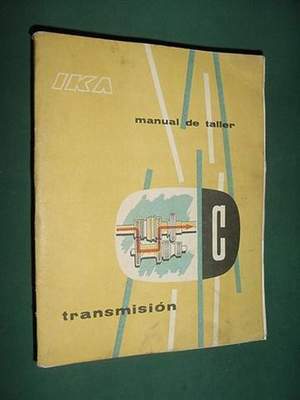 IKA was the monument to modernity within the auto industry in Argentina. 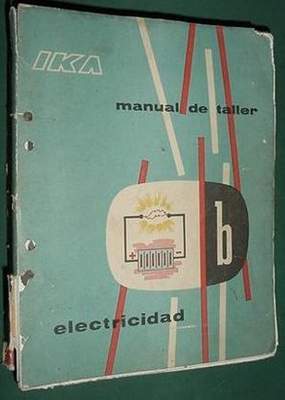 A battalion of expertise engineers from cities all over the world came to Argentina to work on the development of IKA, featuring Latin America's finest top technology applied into industries. 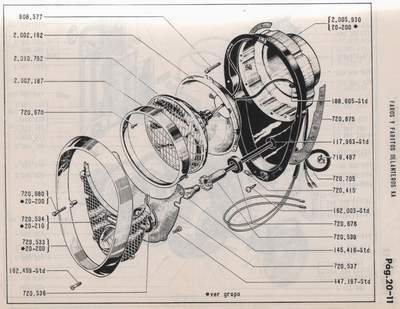 Tide bonds with the US assured IKA a constant flow of technology and machinery of great quality. 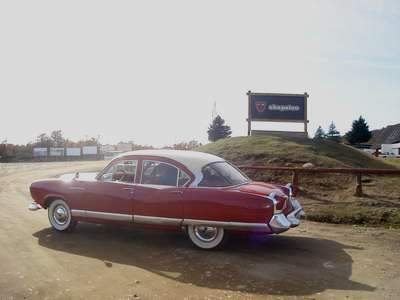 In just a matter of 13 months an empire of car production was built, and it didn't just impacted as competition, but it also reflected its energetic production into related industries. 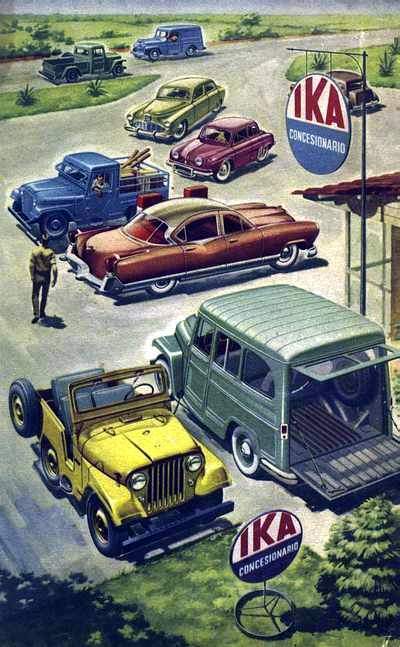 Jeep was it's first and foremost important asset, allowing IKA that first and necessary jump to success. 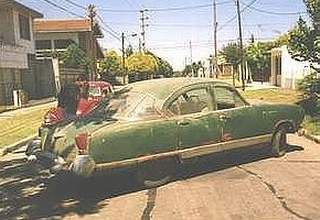 On April 27th 1956, the first fully Argentinean made Jeep was roaming and rolling. 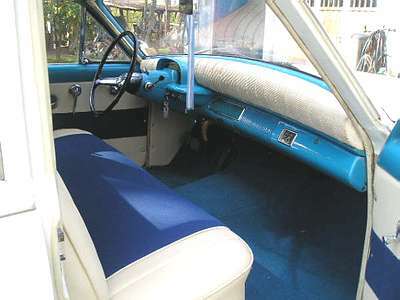 Such was the success that only 145 days after the first IKA Jeep entered the market, they had produced over 1,000 Jeeps! 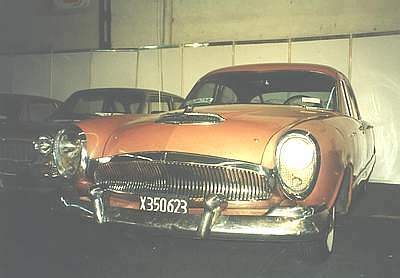 It's important to point out that throughout these first years, it's wasn't just a matter of production, but also IKA aimed to produced as much as they could in a local basis, unlike other competitors who imported almost everything and then unassembled it in Argentina. 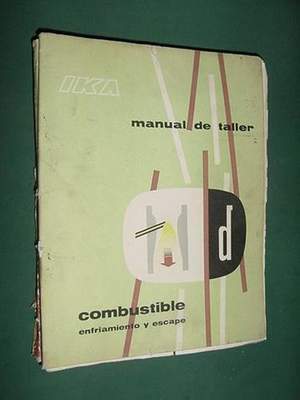 IKA was the mouthful of fresh air the Argentinean industry needed to take off. 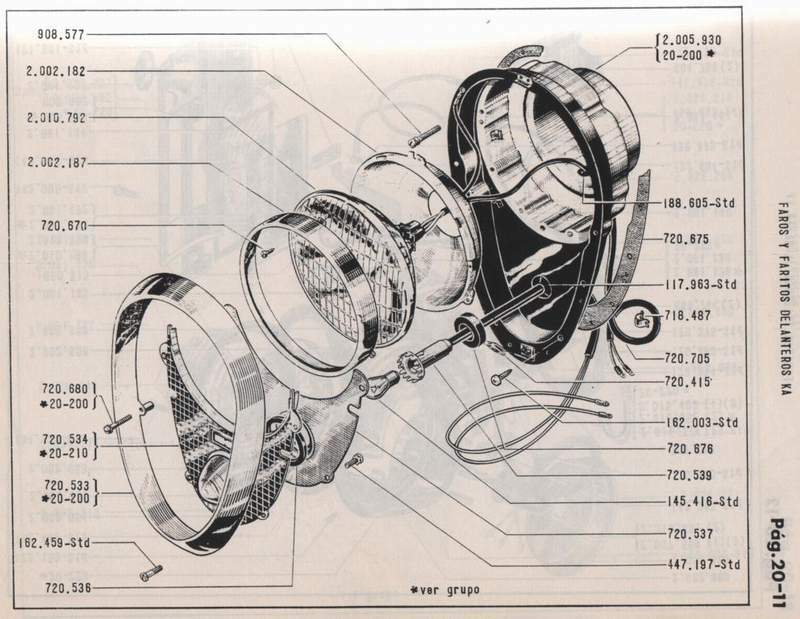 Just to picture out IKA's relevance within the local market, in throughout it's 12 years of production over 20,000 workers depended on IKA for their work. But it wasn't just about a job. 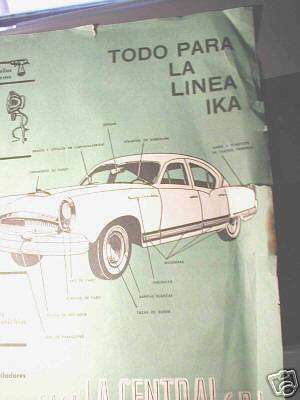 That was -and still is to all those who lived back then- not the only input from IKA to the Cordoba community, for the American-Argentinean company focused also on specialized education: Academia Arguello, Anglo Argentine School of Alta Gracia, IKA Technical Institute. 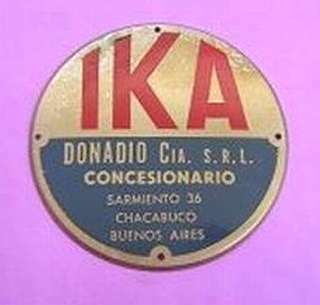 IKA played a central role also in broader cultural aspects, such as holding Art biennials; sports through means of the Inter Industrial Championships and group-home Don Orione. 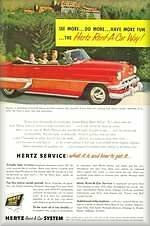 All these broad cultural and social activities were specially designed and carried on throughout the times were James McCloud was chairman. 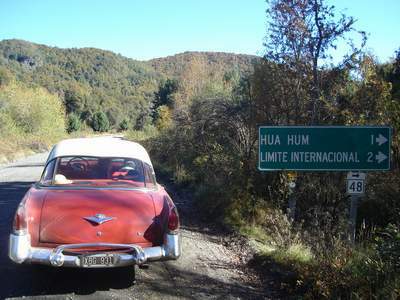 It was a two way street for IKA and the Argentineans and it proved to work perfectly. 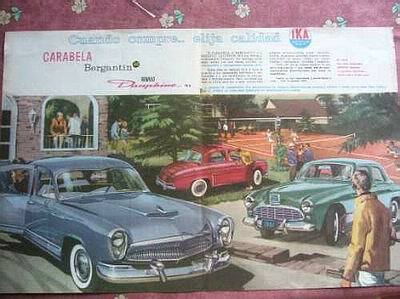 In 1959 IKA becomes IKA Renault, as a result of a joint venture between the American-Argentine company and the French one to produce the French model cars. 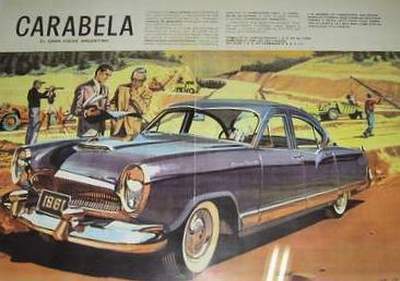 Soon in 1962, another joint model venture would take place between IKA and American Motors Corporation from Detroit; the first Ramblers were produced in Argentina back then. 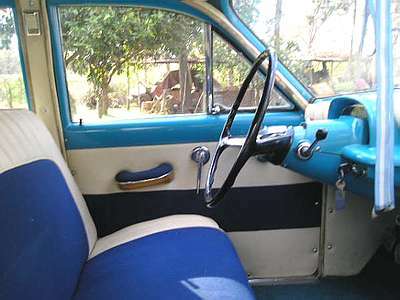 Among the models produced by IKA throughout it's history are these: In 1956 2,400 Jeep and Pick-up Jeep were produced. 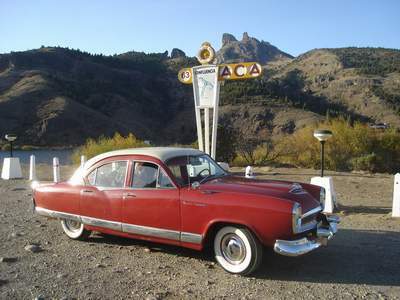 By 1957 the Estanciera and in 1958 Kaiser Carabela, the first grand tourism car fully made in Argentina. 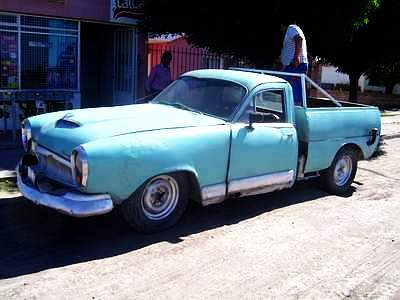 For it's 10 year anniversary the Santa Isabel plant was producing IKA's finest line of broad models: four Renault: Dauphine, Gordini, R4L y R4F; six utility models: Jeep, Pick-up, Jeep Estanciera (also a taxi version), Jeep truck, Jeep Gladiator (500, 1000 kilos) - simple and double traction- and Charge. 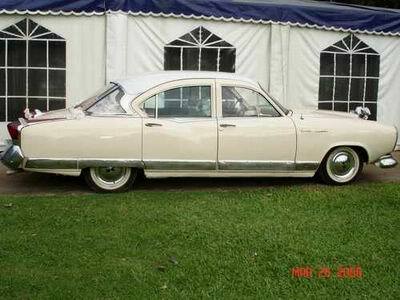 Plus four Rambler models: Classic Custom, Classic de Luxe, Classic cross-country and Ambassador 990. 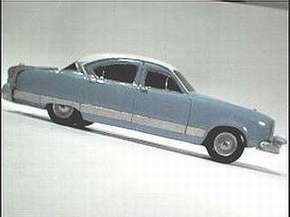 By 1966 they were producing the outstanding Torino model (coupe and sedan). 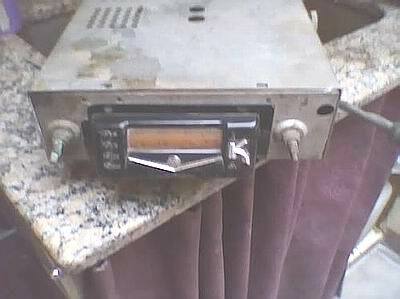 This was an integral IKA designed and developed model. 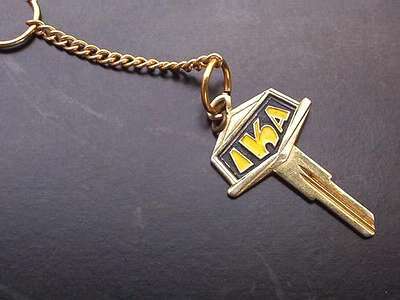 One of IKA's keys to success was what they called combined escalating steps, meaning that each task needed to improve production locally was linked to other minor industries and companies working together but separately in order to combine efforts and perspectives for a broader and bigger production goal. 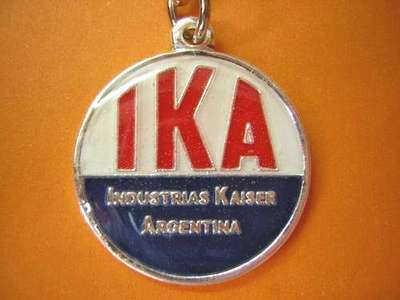 In short, IKA Argentina was one of the many international Kaiser companies who worked by the theme "together we build", being active community members as well as cultural guides and focal points. 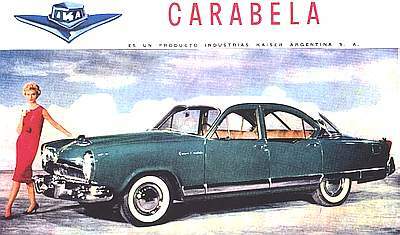 History of the first automobile industrial plant in Argentina. 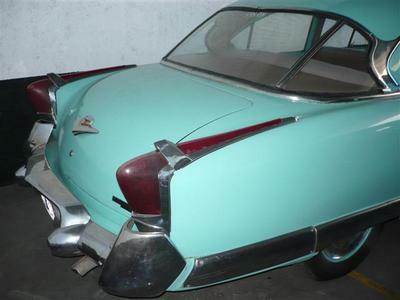 Hope I have been of help to that Kaiser fan! 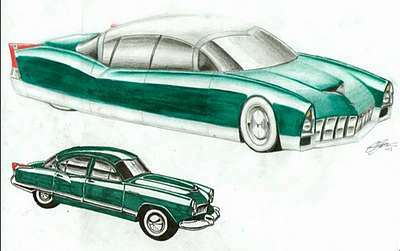 Bob Frassinetti. 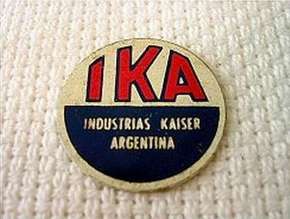 IKA -Kaiser Industries Argentina- was founded on January 19th 1955. 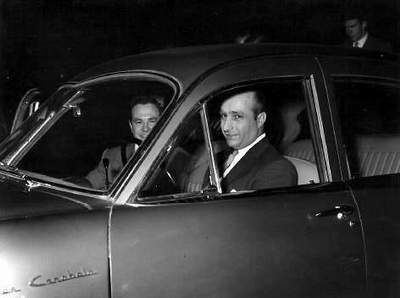 The Argentinean government and the American businessman Henry Kaiser associated to establish an automobile industrial plant in the country. 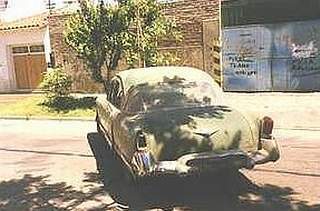 Located in Santa Isabel, Córdoba, this was the first national automobile industrial plant. 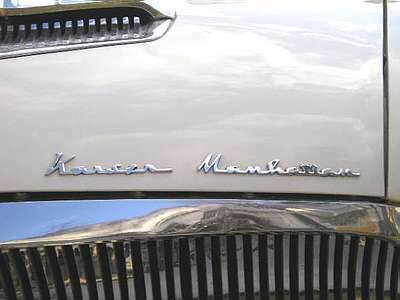 The Kaiser Industrial Center had about two hundred and forty hectares, where, after ten prosperous years, more than eleven hundred workers were employed. 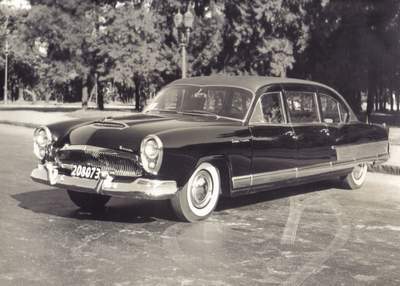 On April 22nd 1955, the worldly famous Kaiser Jeep was, for the first time, produced and sold in Argentina. 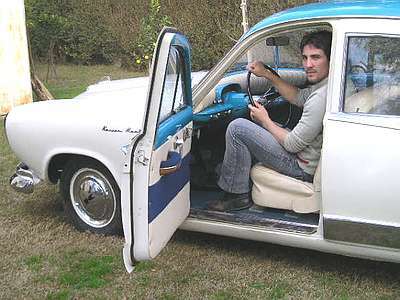 The next year, specially designed for rural purposes, the Estanciera enters the market, an icon regarding merchandize transportation that converged car's commodities and velocity with the dimensions requested by transportation companies for shipping the products; also, this vehicle was more than suitable for the rocky Argentinean roads. 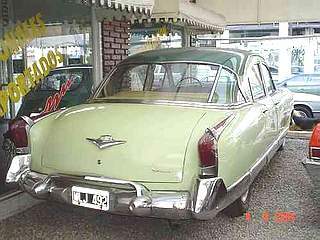 By 1958 the first car to be produced in the country by chain of montage was the Kaiser Carabela sedan. 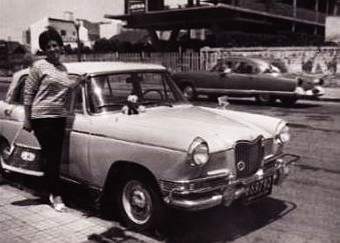 After launching this vehicle to the market, IKA controlled more than the 81% of the national car production. 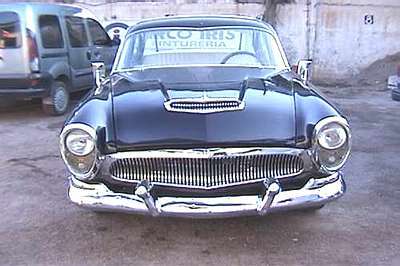 IKA maintained it's high productivity all along it's short history, launching to the market almost one new model per year. 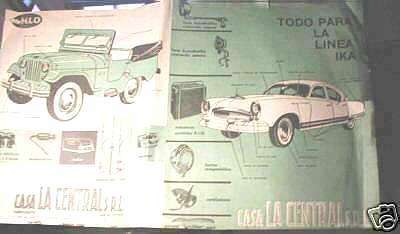 In 1959 Baqueano, in 1960 Kaiser Bergantín and the Dauphine (also the Gordini version), in 1962 the famous Rambler, licensed by American Motors, in 1964 it produced a new Jeep: the Gladiator, and by December with less than ten plants in the country IKA exceeds the 250.000 autos production. 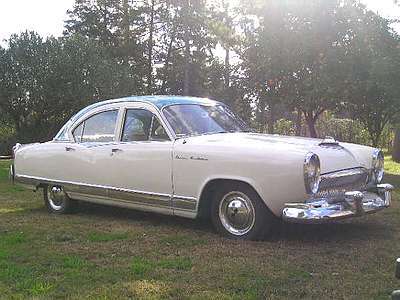 By April 1965 the company produces a new Rambler with Tornado engine, and includes this powerful engine to other models such as the Estanciera and the Gladiator Jeep. 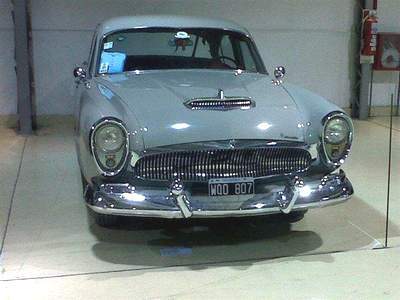 On October that year, IKA buys SIAM auto industries increasing even more its vertiginous growth. 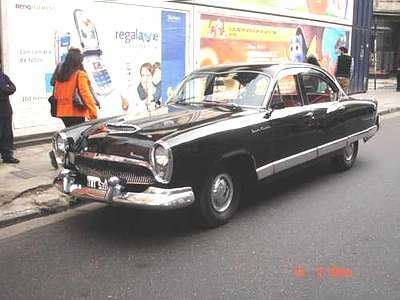 In 1966 the Torino, IKA's first integral national product enters the market. 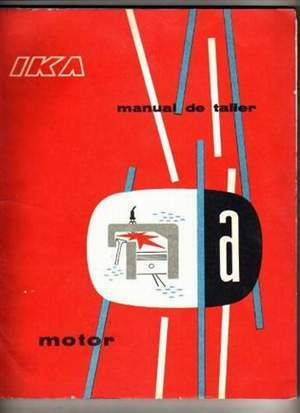 One year latter, on November 1967 Régie Nationale des Usines, Renault joins IKA. 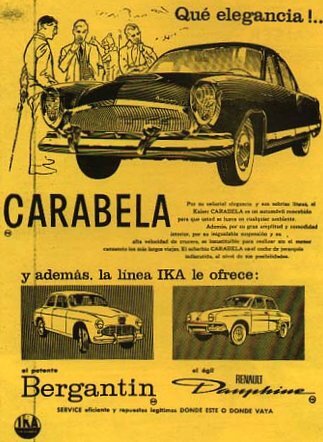 >From then on, Kaiser would no longer be IKA, but IKA-Renault, a very profitable partnership that would soon give birth to mass consumption models such as the Renault 12. 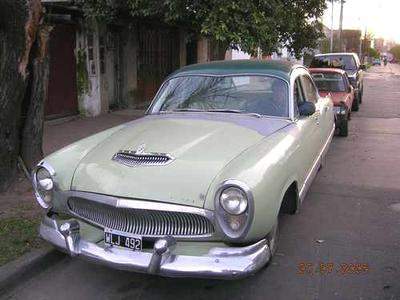 This opens a new era in the Argentinean car industry. 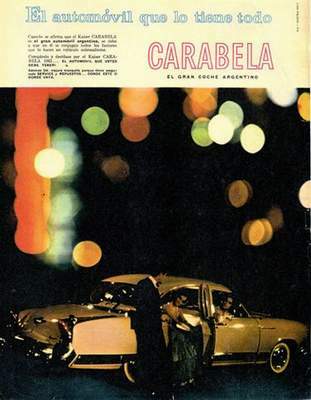 As for after 1975, the plant located at Santa Isabel would no longer be IKA, but Renault Argentina S.
There's a mystery around the Argentine Torino car. 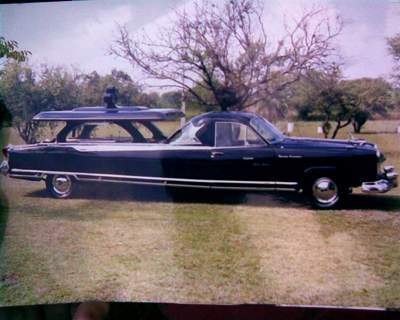 This model is not only not a Ford, but it's completely different from the American version. 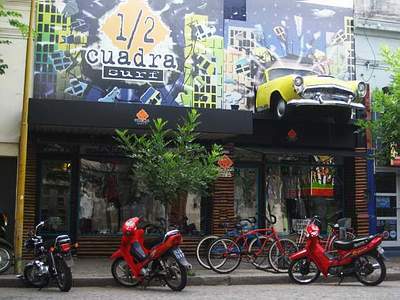 The first question that arises is: How did the Argentineans managed to use an American trademark for a completely different product without being busted? 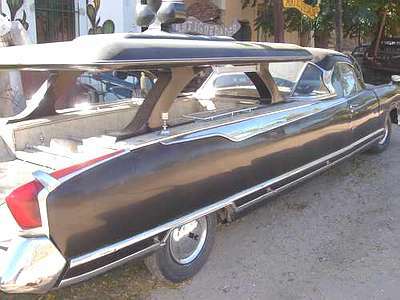 First a bit of history about the magnificent American Torino model. 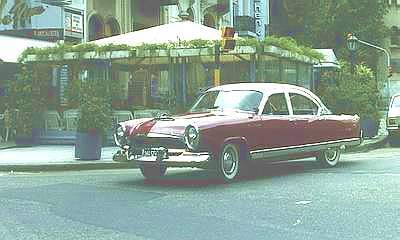 This car was produced by Ford for the American market between 1968-1976. 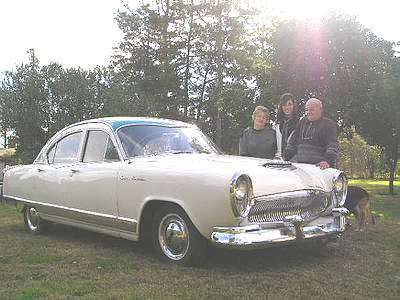 It was a medium size version for those days' standards and it replaced the Ford Fairlane, although that name was retained for the base models with different trim than those that wore the Torino name. 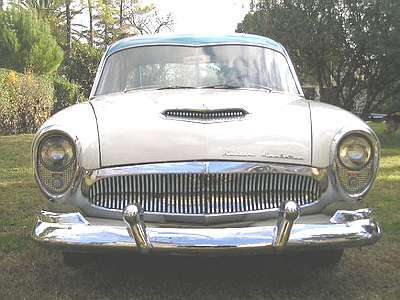 Available in a number of body styles this model featured a two-door fastback, two or four-door hardtop, a four-door station wagon, and a two-door convertible, while the Ford Ranchero car-based pickup used the same front end. 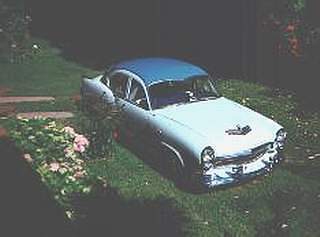 Engine choices ranged from a 302 cubic inch small-block V8 to Ford's FE series 390 cubic inch big-block. 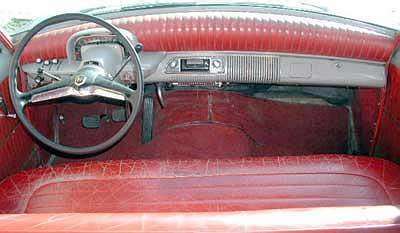 The Torino GT was the upscale model, with extra 'sport' trim. 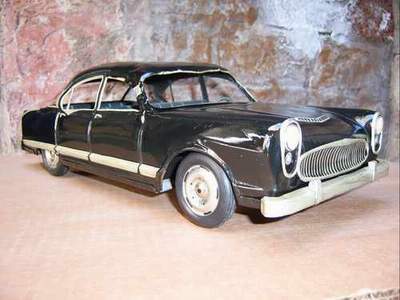 During the following years much work would be done around this model, impoving its outstanding characteristics and expressing the latest innovations within the autoproduction industry. 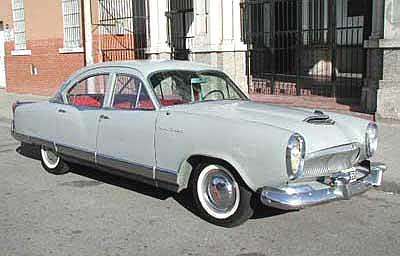 Its stylish and cool appearance was what guys called a "chick magnect" as well as an outstanding car. 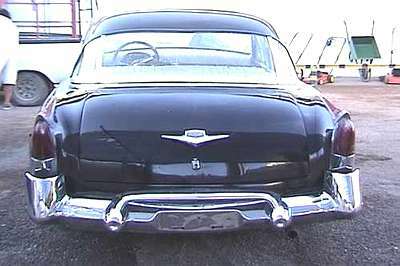 That's why it has remained as a beloved and covetted possetion to our days, when some of these terrific pieces are collectables. 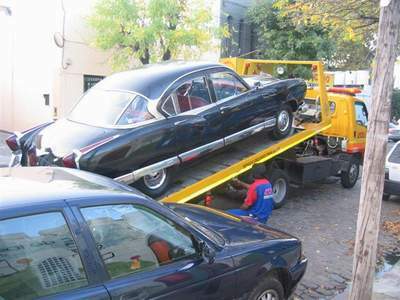 The Argentinean Torino also has a rich history to offer. 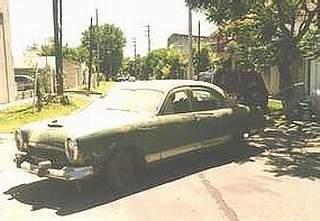 Alike the American Torino, the Argentinean one was a breackthrough automobile. 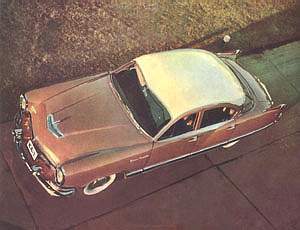 In 1966 the Torino, IKA's first integral national product enters the market. 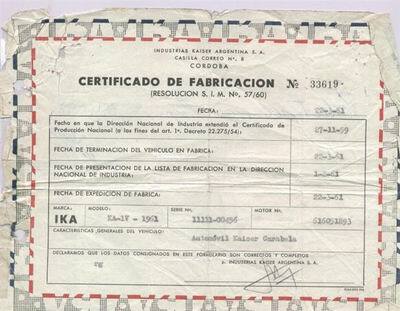 One year latter, on November 1967 R¿gie Nationale des Usines, Renault joins IKA. 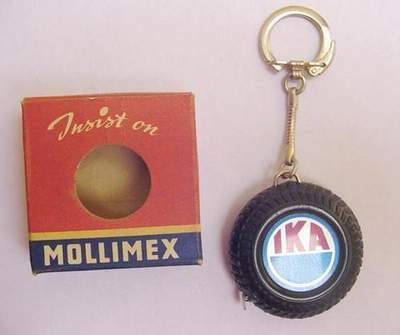 >From then on, Kaiser would no longer be IKA, but IKA-Renault, a very profitable partnership that would soon give birth to mass consumption models such as the Renault 12. 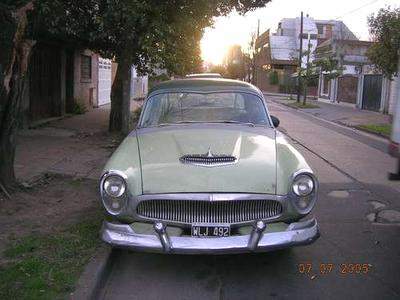 This opens a new era in the Argentinean car industry. 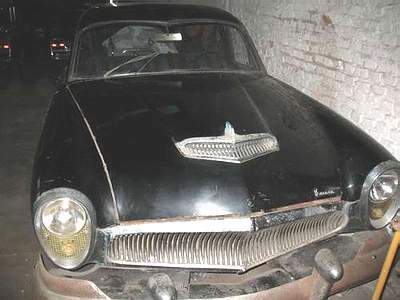 According to the sources we've researched, IKA and American Motors had signed an agreement for this car's production in our country. 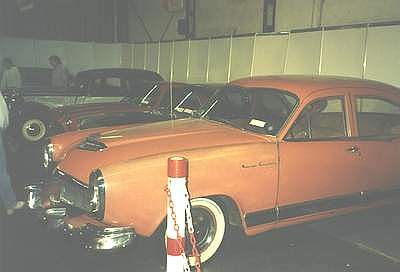 The Rambler American Rouge was the foundation from which engineers and designers would be working on to create "our" Torino. 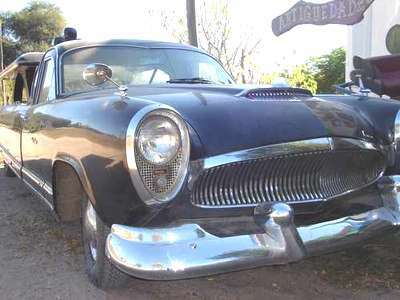 The famous Italian carman Pininfarina would be the one who would adapt that standard version to the Latin style market by altering the front end and grille as well as the interior. 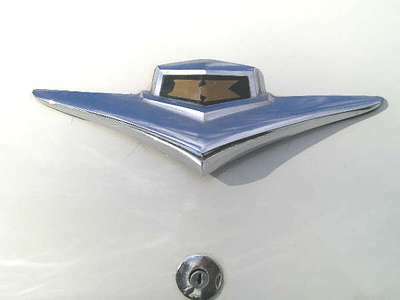 The ultimate cool detail was the bull plaque on the grill, as a homage to the Argentine's pampas that at the same time traced a link line with Ferrari's "cavallino rampanti"-wild horse- and Lamborghini's bull. 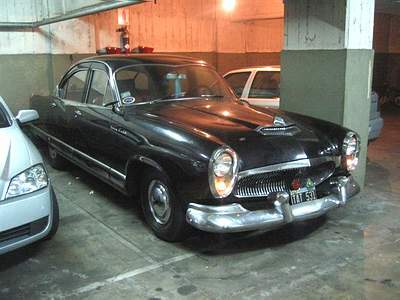 On November 30th 1966 this glamorous car was presented to the Argentine market. 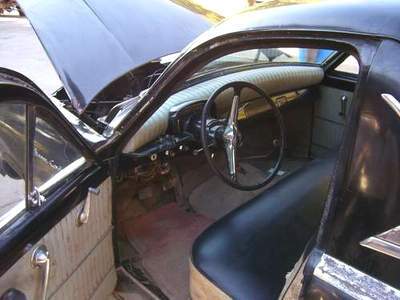 Alike the American model, this Torino's impact on the consumers' market was just perfect. 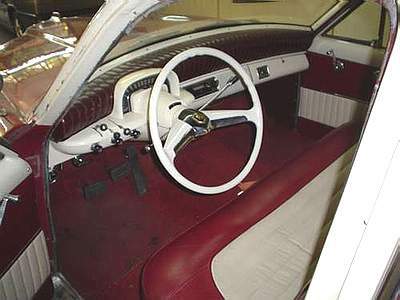 Everybody wanted to own a Torino, it was a cool, glamorous, fast and top of the top possession. 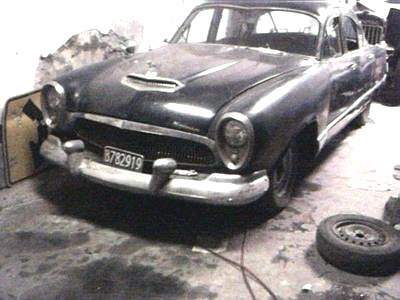 Specially after the record breaking in Nuremberg in 1969 after 84 hours run. 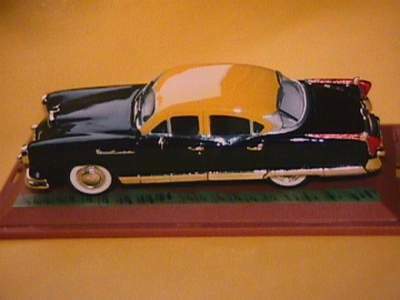 And also, alike the American one still is, and has become a precious collectible for those automobile lovers. 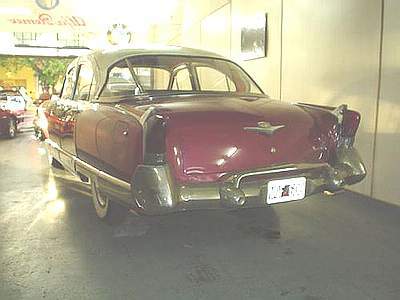 Such was this car's impact in to the Latin market that soon after it was released, there were made scale auto models reproductions of this beauty. 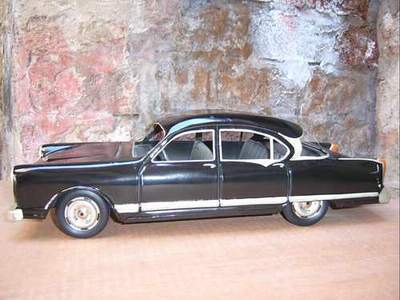 Among the most careful and glorious diecast Torino examples was Buby's, a coveted toy back then and a beloved collectible nowadays. 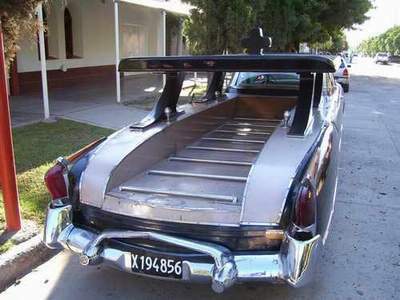 It appears the mystery has been solved. 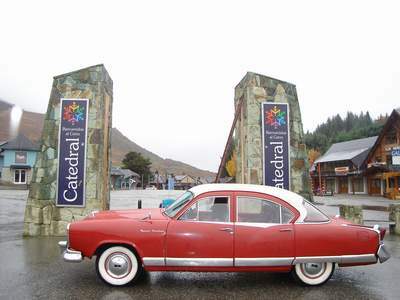 Two different models, sharing the same name which have had an incredible impact within the automobile market and have set really high standards for future productions and left a permanent mark within this industry's evolution. 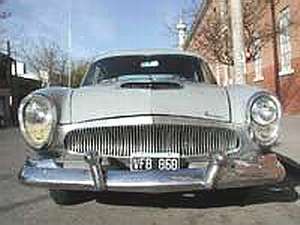 In the 1950's and 1960's Great Britain and Argentina were friends, and did a great deal of trade with each other. 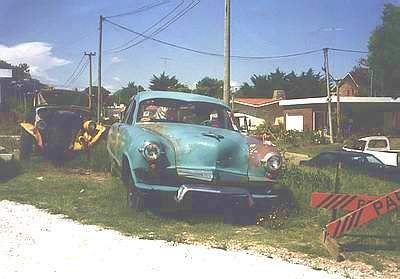 Should you ever visit Argentina, even today you will still see evidence of the huge amounts of railway furniture we sold to this country. It is almost like looking at our old 'British Railways' back in the 1960's, with copies of our rolling stock, and even down to the signalling equipment. Another tie with a part of the UK was the number of Welshmen who emigrated there to become coal miners. 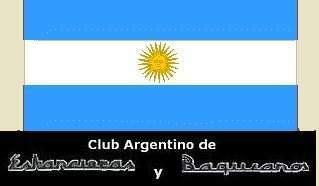 Patagonian Argentinians still speak a form of Welsh today. 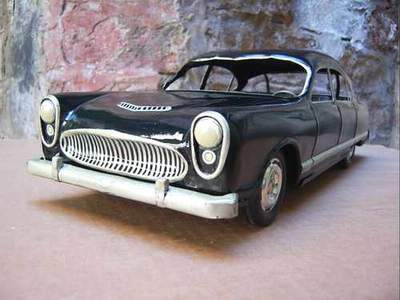 At the same time the UK motor industry also gained a hold on that continent, and contracts were exchanged for the licensed production of selected BMC models. 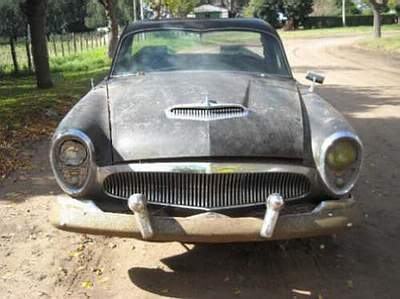 The Argentinians wanted a solid, dependable and reliable car, that could take the rough roads, and rough treatment the locals would meter out. 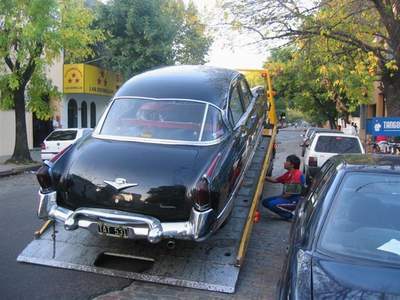 The car would also be sold as an up-market 'de-luxe' saloon. 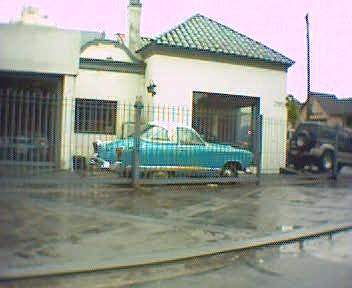 The company who was to build the BMC vehicles was " Torcuato Di Tellas Industries", of Buenos Aires, whose engineering pedigree dated back to 1910. 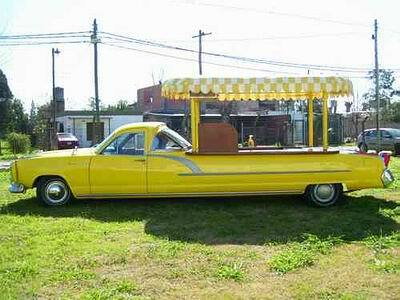 They had become a giant industrial company since, building things like that railway rolling stock of British design. 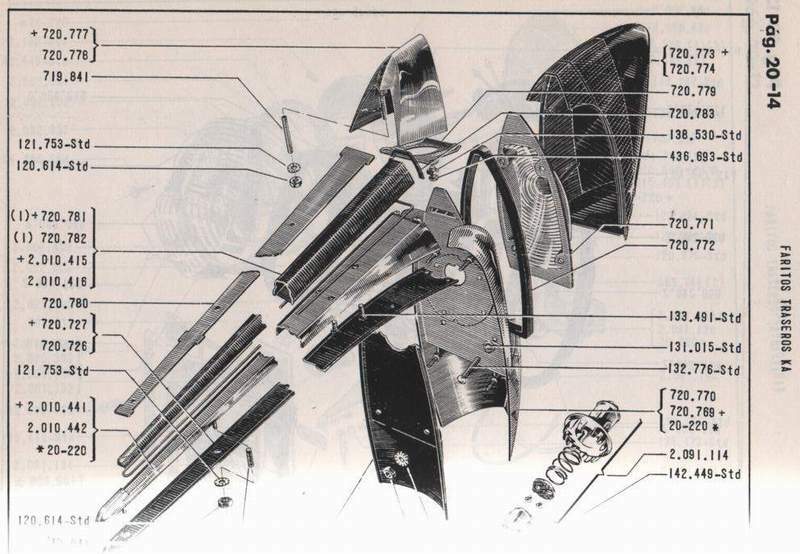 Their products also encompassed steel making, electrical motors, cranes, ships, trains, and now motorcars. 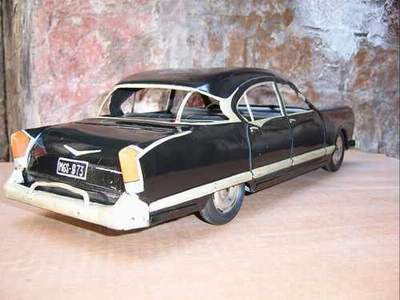 With BMC technical support, 'Di Tella' were to build the 1959 Riley version of the Farina saloon car, called a 'Di Tella 1500', both as a four door saloon for use as a taxi and a base 'family' model. 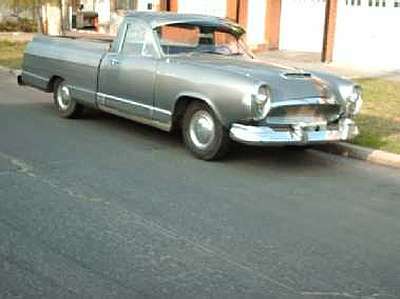 The Riley was also sold as the 'Argenta' pick-up, a fate many of the older '1500' taxis were converted to in later life. 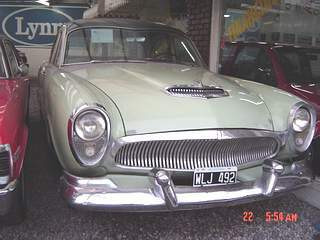 There was a Morris Oxford Traveller in the range, now called a 'Di Tella Traveller'. 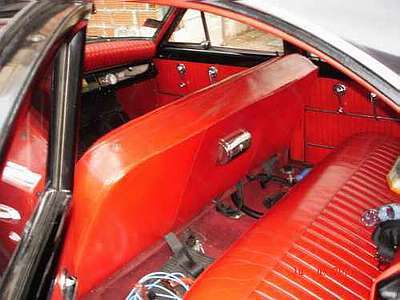 The engine was the unburstable single carb BMC 1489cc 'B' series. 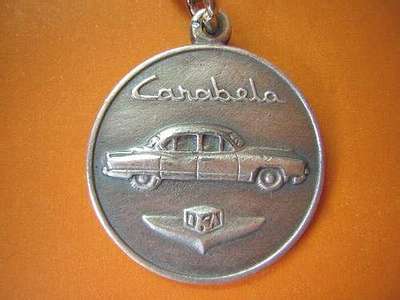 The Di Tella motif is not unlike a single 'S' from the WW2 German SS emblem. 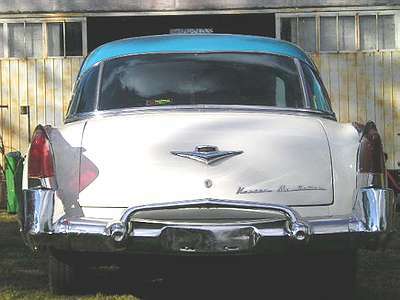 The very strong bumpers and overiders were necessary due to the parking habits of local drivers, and for pushing loose animals out of the way. 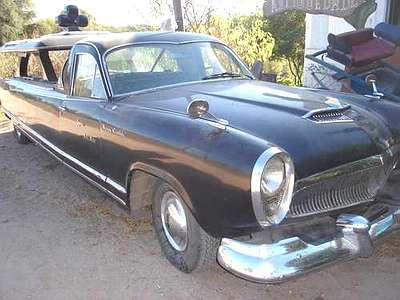 The sharp Italianate 'Pinin Farina' styling of the car, with its cut-off fins, attracted the attention of the hot-blooded Argentinians; a very opposite view of M.G. 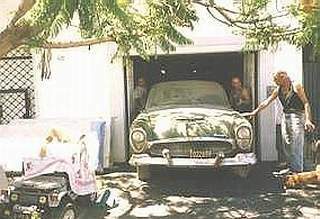 enthusiasts at that time! 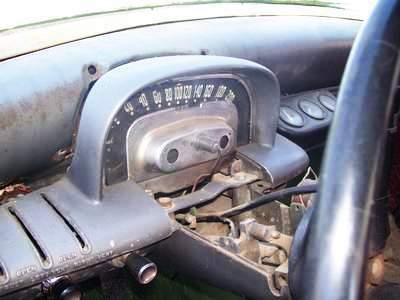 In the Argentinian car the dash board looked identical to the UK M.G. 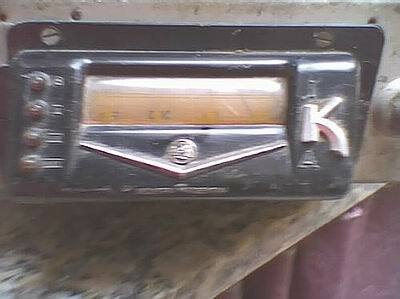 version, the same shape and instruments, but was infact a large plastic moulding. 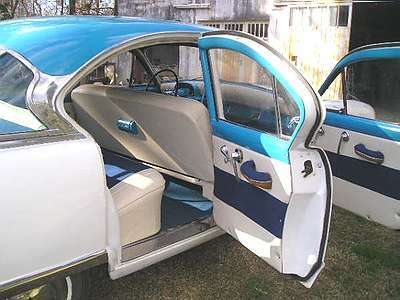 Many corporate parts were used to modify the Di Tella Magnette for Argentina. 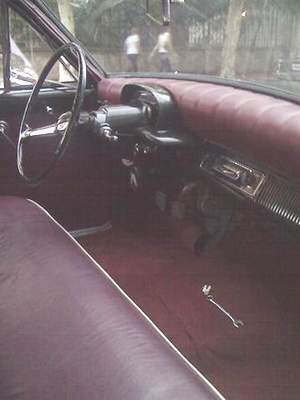 The steering column gear change was standard issue on the previous Austin A55, and an option on the Farina Morris Oxford. 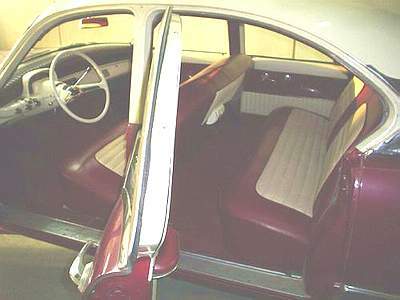 As the Farina Magnette uses the A55 floorpan and running equipment, the 'modification' already existed. 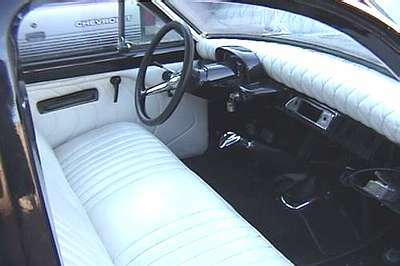 In the UK this column change, normal BMC gearbox was available with an overdrive, but it is not known if this was on offer in South America. 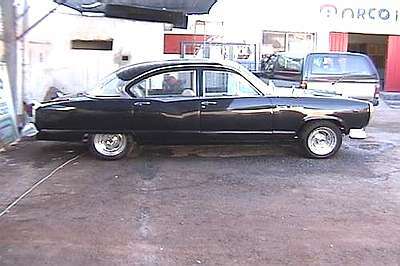 1962 saw the Di Tella Magnette update with the M.G. 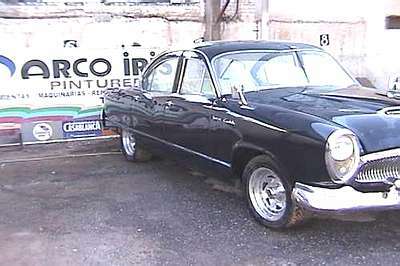 Mk4 Magnette 1622cc engine, though the '1500' continued unchanged with its 1489cc version. 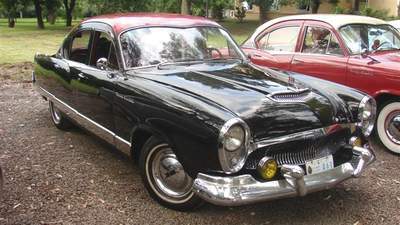 It is not yet known if the cars were updated as in the UK, with the longer MK4 wheelbase and suspension improvements, ( though I suspect not on this locally produced car.) 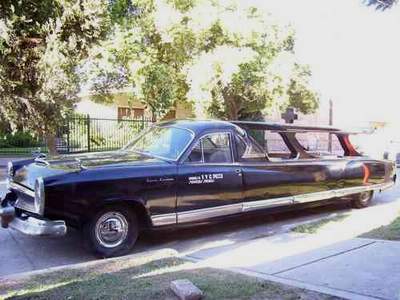 The bigger engined 'Magnette 1622' still had the option of single or twin carbs, but the rear axle had been changed. 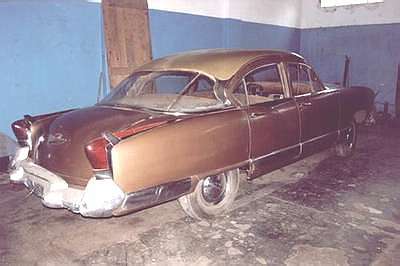 The Di Tella's now used an American sourced rear axle on it's cars, a Kaiser version built by a local company called Dana. 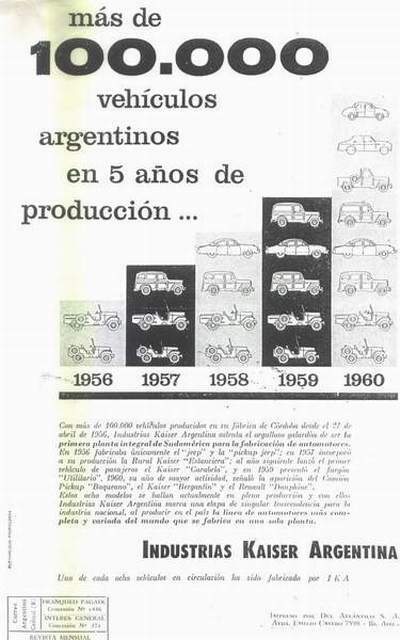 Production of the Argentinian 'M.G.' 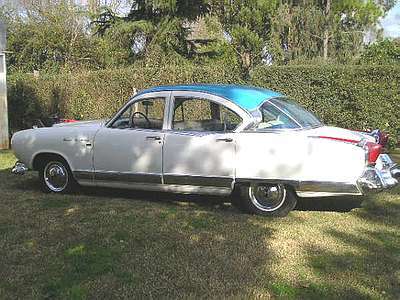 between 1960 and May 1966 was 2,654 cars. 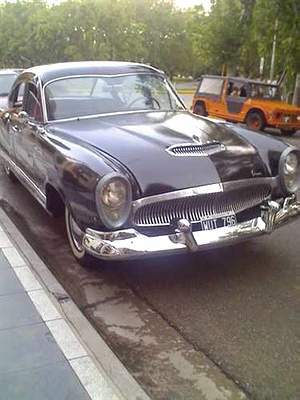 From IKA only 235 'M.G'. 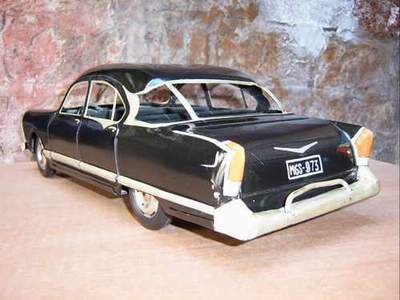 models were built. 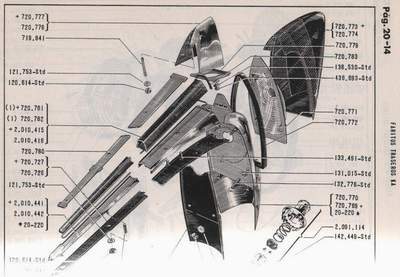 Compare these figures to the 45,000 Di Tella 1500's, and 2,537 IKA 1500's. 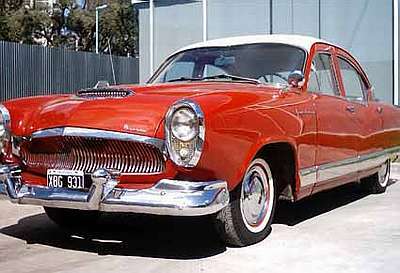 The 'Traveller' estate car and 'Argenta' pick-up numbers are not known, but are probably in excess of 30,000. 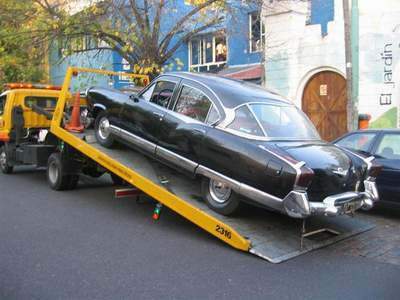 The few remaining Di Tella 'Magnette', and 'Magnette 1622', are now being collected by M.G. 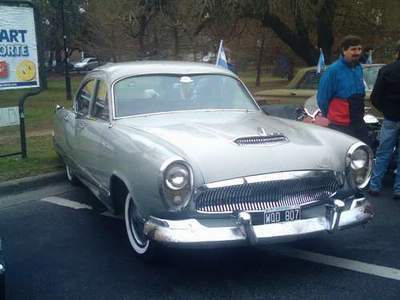 enthusiasts in Argentina. 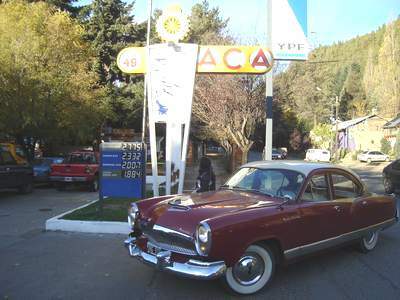 One enthusiast is MGCC member Alejandro Mogni of Cordoba, Argentina, who already owns a 1946 M.G. 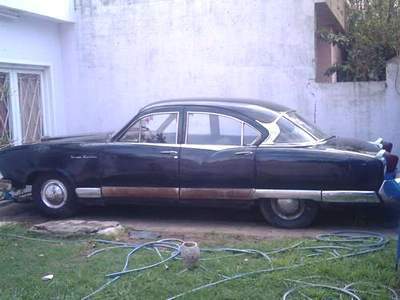 TD, a 1947 M.G. 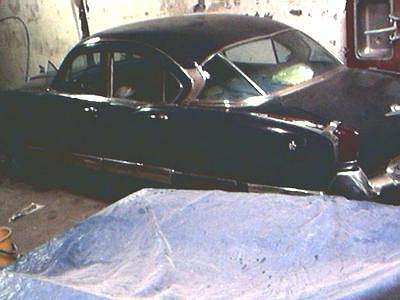 'Y', a 1959 MGA 1500 ( under restoration,) and now a 1966 Di Tella Magnette 1622 ( awaiting restoration,) who supplied the information for this article. 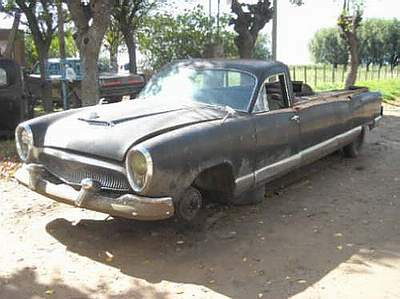 In the UK the poor M.G. 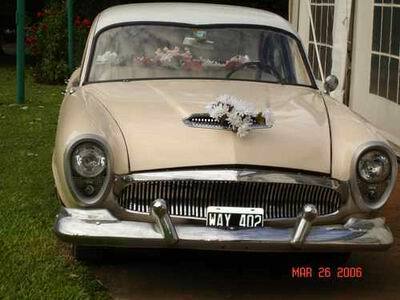 Farina Magnette had a low image, but in South America its sister car was a desirable and up-market limosine. 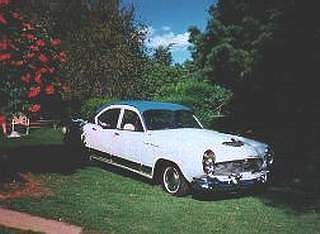 Jim Mc Cloud was born in West Oakland, California, on July 2, 1918. 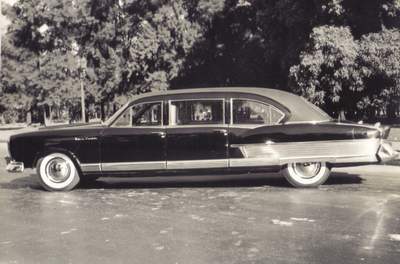 Following a year in the Civilian Conservation Corps, he graduated from St. Mary's College High School in Berkeley in 1936. 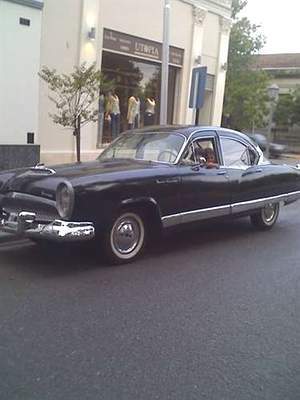 He graduated from Stanford University in 1941 with a degree in mechanical engineering. 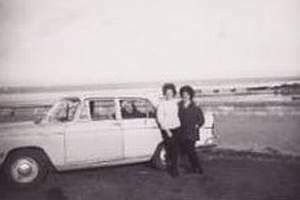 Immediately following graduation, he started work as a Junior Engineer at Kaiser's Shipyard # 1 in Richmond, California. 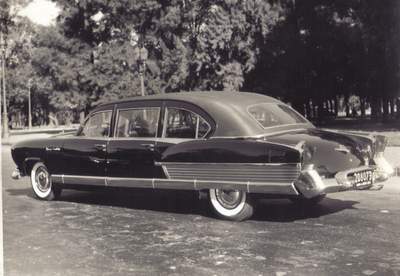 He was soon appointed Field Construction Superintendent at Richmond Shipyard # 2, and upon completion of construction was transferred to Richmond Shipyard # 3, where he later assumed the duties of Outfitting Superintendent. 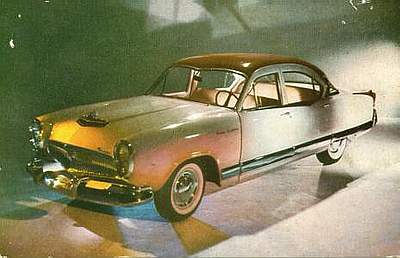 After the completion of new ship and repair contracts, McCloud was transferred to the Kaiser-Frazer Corporation at Willow-Run, Michigan, then to the Detroit Engine Division in Detroit. 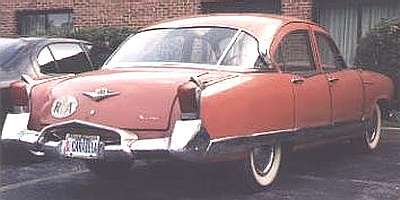 After several different assignments, he became General Manager of the Division in 1953. 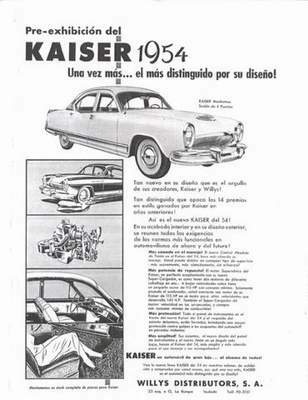 Upon the incorporation of Industrias Kaiser Argentina in 1955, McCloud was appointed Vice President, General Manager and Board member. 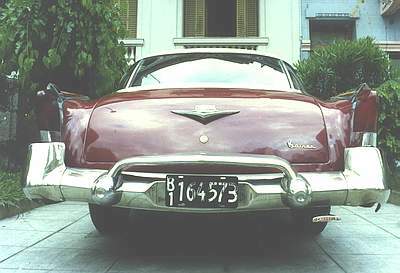 He was elected President of IKA and its subsidiaries in 1959. 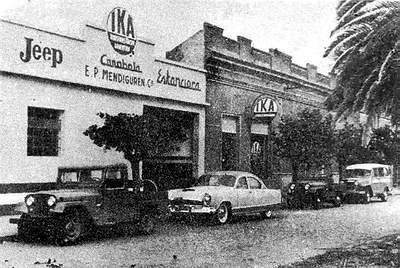 Following the sale of the Kaiser equity in IKA, McCloud became President of Kaiser Aluminum & Chemical Corporation's activities in Argentina. 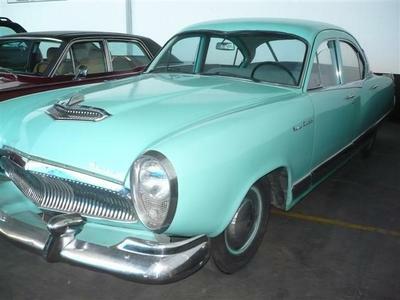 He returned to Kaiser Headquarters in Oakland in1972 as Group President and Director, Kaiser Industries Corporation. 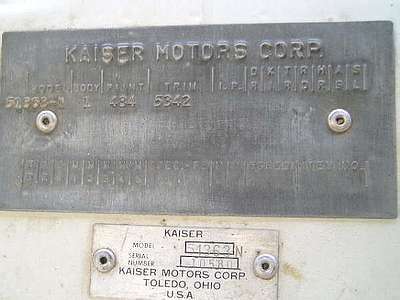 In 1974 he was appointed President of Kaiser Engineers, Inc., a position he held until his retirement in 1983. 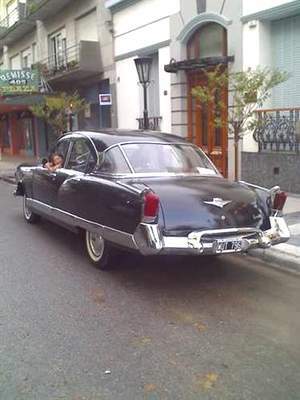 This picture was submitted by Franco Cipolla, Ediciones del Boulevard. 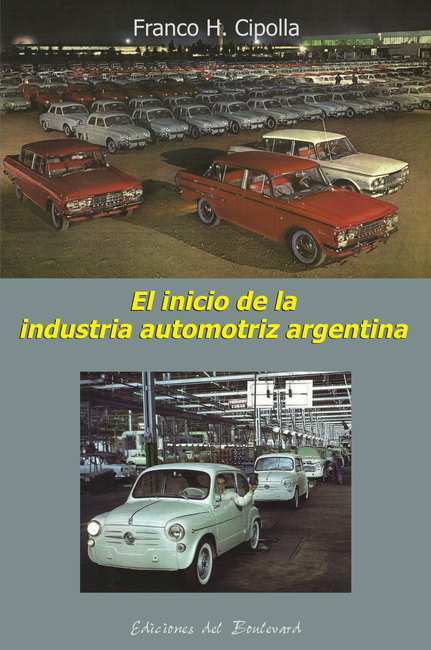 "El inicio de la industria automotriz en la Argentina data de casi tanto como los primeros automóviles que circularon por el país. 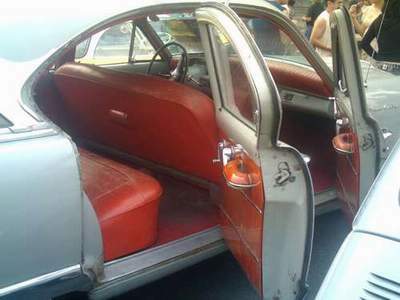 Fue en 1903 cuando el español Manuel Iglesias comenzó a armar un vehículo de factura artesanal que recién terminó en 1907. 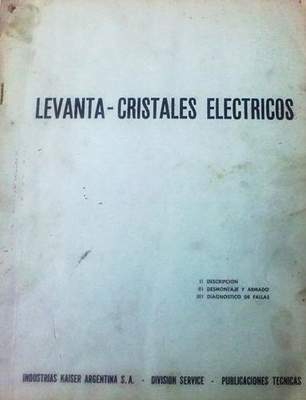 Empero, quizá el primero de todos haya sido el `Anasagasti´ de 1910 que se mantuvo pocos años en producción; aunque las escasas cincuenta unidades (estimativamente) ensambladas no alcanzan para considerar una producción seriada." "(...) Impulsado por vaivenes económicos y políticos, la posguerra, y por incorporar a una gran masa trabajadora a la vida industrial de la nación, los militares revivieron los proyectos de alta envergadura que soñaron alguna vez los Generales Savio y Mosconi. 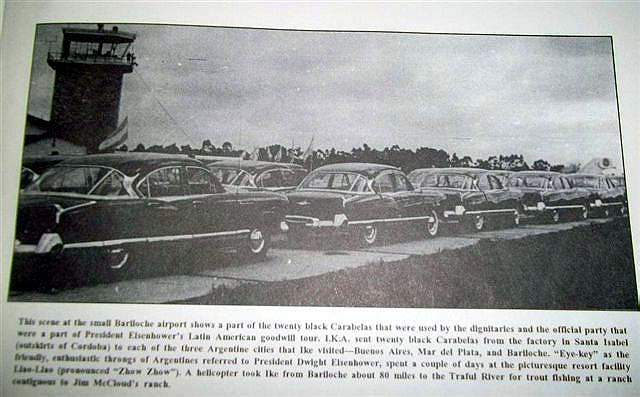 Y.P.F., Fabricaciones Militares, Siderurgia Argentina, y ahora, la Aeronáutica militar eran las alma máter de la naciente Industria Argentina." 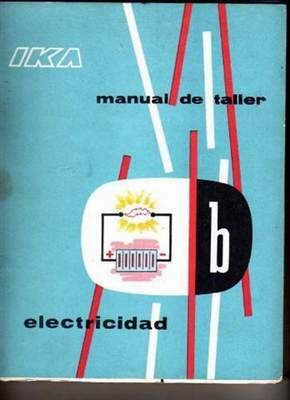 "No obstante sería el capital privado (y foráneo) quien pudiera aportar el `know how´ y la asistencia técnica necesaria, tras vasta experiencia en EE.UU. 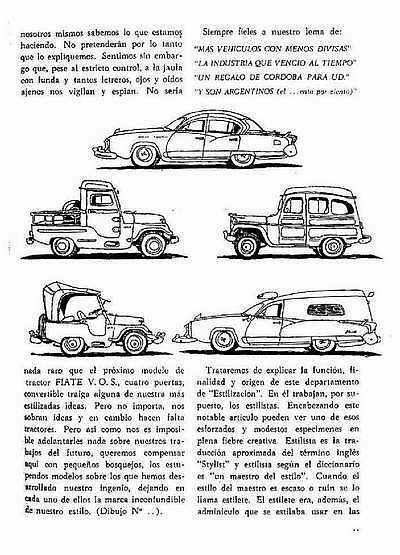 y Europa, a fin de fabricar en el país modelos de automóviles, camionetas, camiones, que habían sido desarrollados en latitudes altamente industrializadas. 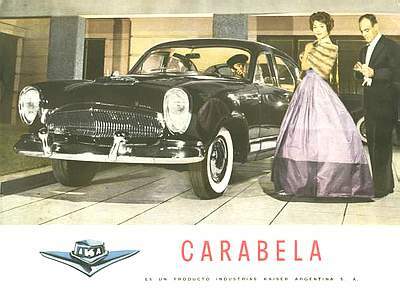 Casi al mismo tiempo en que era creada I.A.M.E., Mercedes-Benz comenzaba sus actividades en la Argentina, aunque no es sino hasta 1956 en que I.K.A. 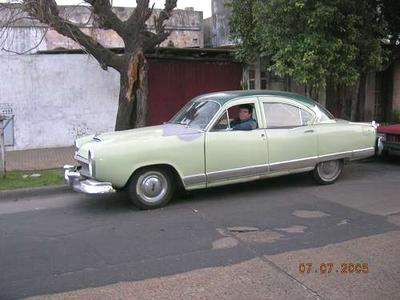 produce el primer Jeep en Córdoba, que podemos contar con una verdadera factoría para la producción de automotores en serie a gran escala, y el consiguiente desarrollo de la imprescindible industria autopartista, prácticamente inexistente hasta entonces." 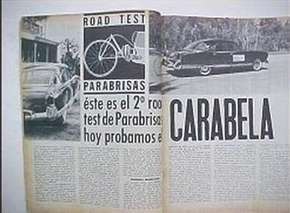 "(...) Es el fin de esta obra centralizar las actividades de las fábricas pioneras en la producción a gran escala, y en parte de capital nacional, es decir, I.A.M.E., Mercedes-Benz, I.K.A., Fiat, y SIAM Di Tella. 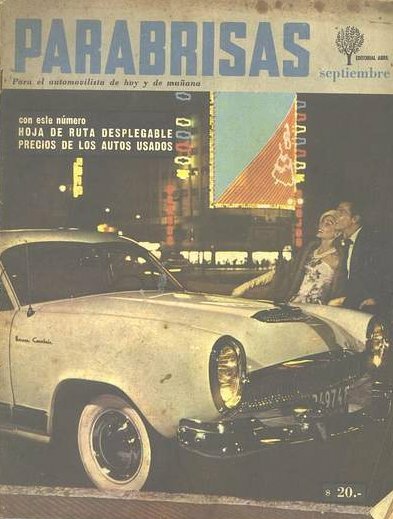 (...)"
"(...) Que la historia de estos tiempos formativos de la industria automotriz argentina, sirva para que se profundice la conciencia de cuanto esfuerzo requiere el éxito de una política industrial proyectada hacia el futuro." 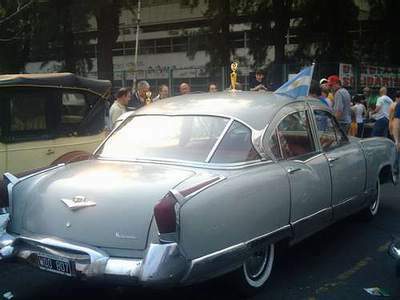 Las consiguió por medio de un nieto de Gerónimo Gnecco, el famoso carrocero que estaba ahí por Dorrego, enfrente al Mercado de las Pulgas. 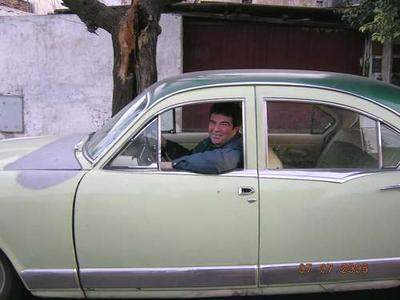 Este hombre le confirmó dos cosas las limos fueron dos y las hicieron ellos por pedido de IKA (ésta entregó los 2 Carabelas originales). 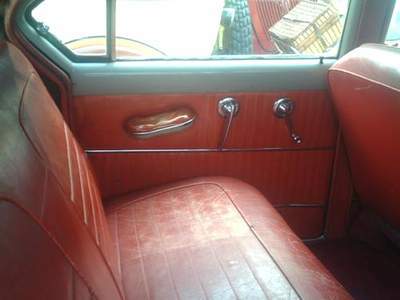 Todo el interior con la whiskera lo diseñó Gnecco. 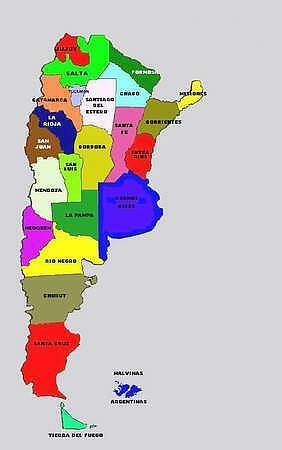 Decían que eran para Presidencia. 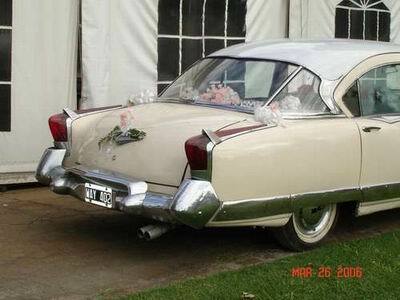 Juan Carlos Tuzzolino from Argentina submitted the following pictures of his 1955 Kaiser Manhattan. 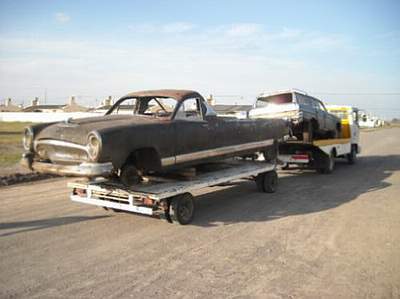 The before and after pictures show what he did to have such a beautiful car. 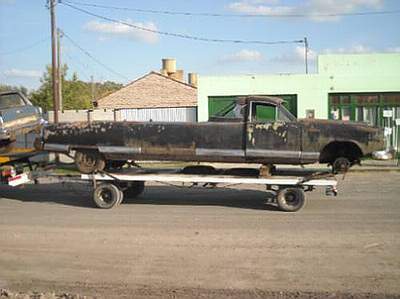 He should be very proud of the results. 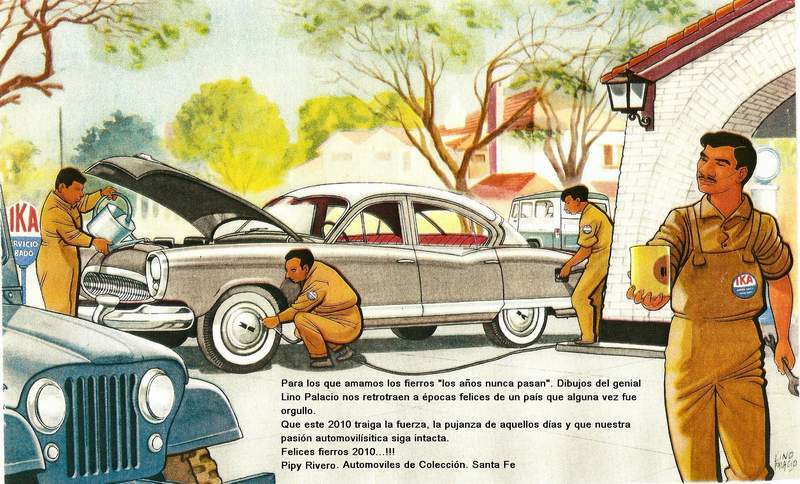 Juan Carlos also submitted the dark blue over light blue pictures. 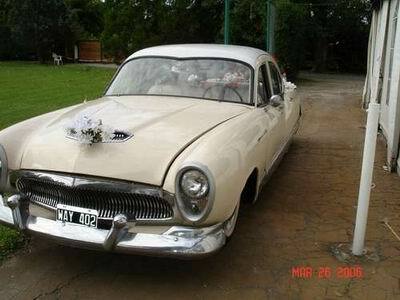 They are of the car of a friend of his in Argentina. 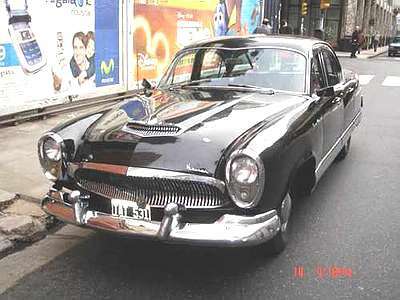 1961 Kaiser Carabela This car is also owned by Juan Carlos Tuzzolino from Argentina. 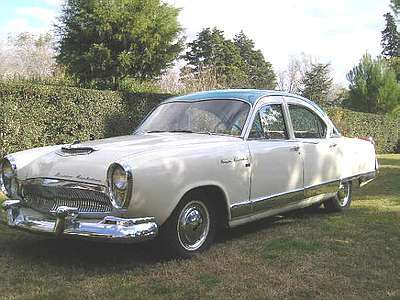 The Henry J was imported into Argentina. 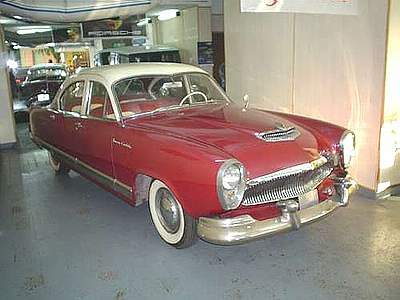 The following is a 1951 Model. 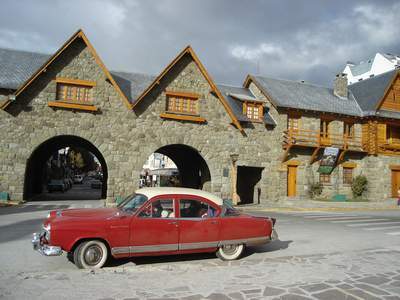 acceso a las plazas traseras. 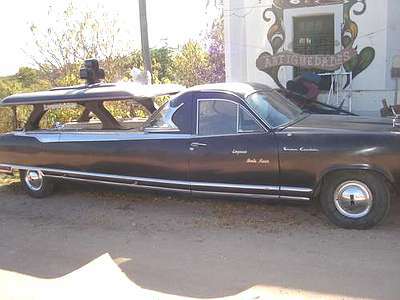 no existían...¿Qué habrá sido de ese vehículo, todo un símbolo? 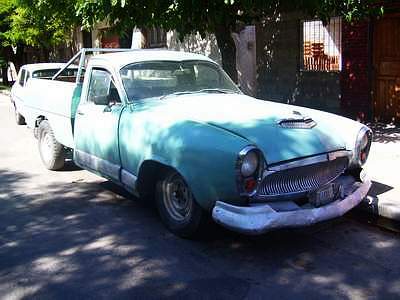 Tal vez todavía se lo pueda encontrar arrumbado en algún gallinero tucumano. 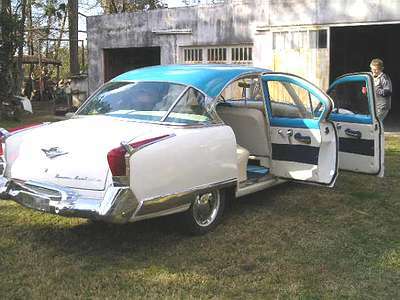 with doors of major largeness for access to the rear squares. 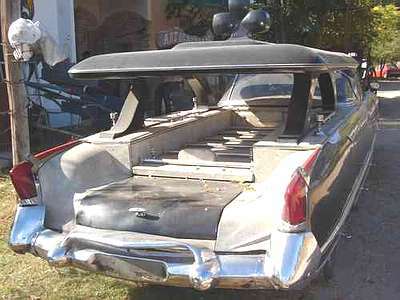 And this was precisely what did to itself when a convertible Caravel was constructed equipped with automatic box the one that I believe it was assigned to McCloud. 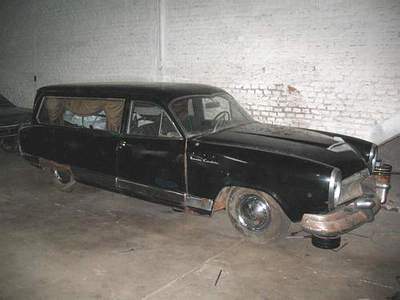 This vehicle went to stop finally to hands of a tucumano the one who in his opportunity came to the factory in search of restored for the above mentioned box that of course they did not exist... What will have been of this vehicle, the whole symbol? 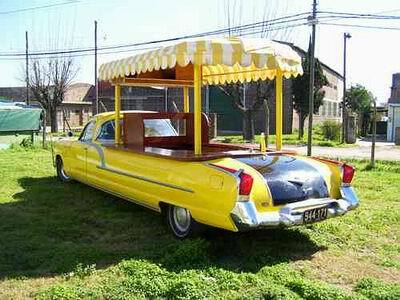 Perhaps it is still possible to be put aside it in some henhouse tucumano. 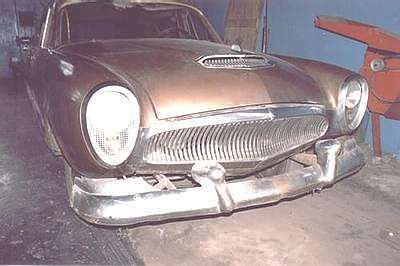 Another series of pictures showing the exterior of the IKA factory when it was in full production. 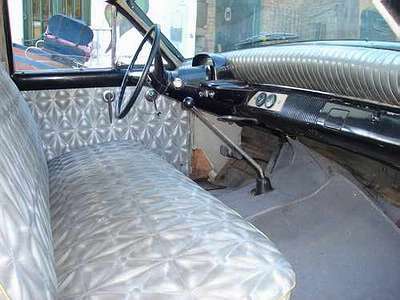 Many people look at these beautiful restored cars and wonder what the owner started with. 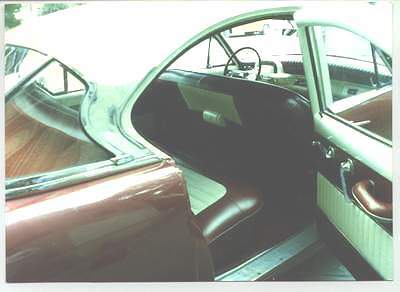 The pictures below will give you some idea of the work involved in restoring on of these cars. 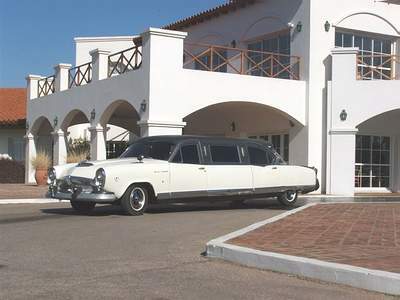 Muchas personas miran estos coches restaurados hermosos y maravilla con qué el dueño comenzó. 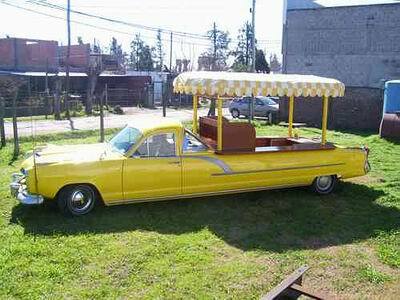 Los cuadros abajo le darán alguna idea del trabajo implicado en restaurar en de estos coches.